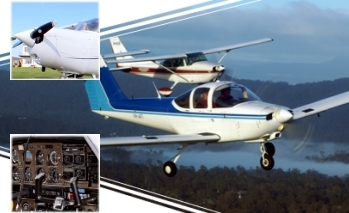 The trial lesson is preceded by a short flight briefing with our instructor who will explain all aspects of the flight including the effects of controls and how the aeroplane flies. The student will then be allowed to take the controls and actually fly the aircraft! Bristol Airport is an international airport which is located in North Somerset, it is a commercial airport serving the city of Bristol, England, and the surrounding area. It is 8 miles southwest of Bristol city centre. Cranfield Airport is an airfield situated just outside the village of Cranfield, 8 miles south-west of Bedford in Bedfordshire, England. It was originally RAF Cranfield in World War II. RAF Henlow houes the Centre of Aviation Medicine and is a Royal Air Force station situation in Bedforshire, England. It was built by MacAlpine between 1917 and 1918 and was chosen as a military aircraft repair depot in 1917. Bodmin Airfield is situated 4 miles northeast of Bodmin, Cornwall, England, UK. All aircraft strictly require permission to land prior to arriving. Radio equipped microlights can use Bodmin also. Located 6 miles east northeast of Carlisle, Cumbria, England. Carlisle Lake District Airport is a small regional airport. Located in the east of Darlington in North East England, about 10 miles south-west of Middlesborought and 24 miles south of Durham, Durham Tees Valley is an International airport. Situated in East Riding of Yorkshire, England, Beverley Airfield also known as Linley Airfield is an unlicensed aerodomre located 5 miles north-east of Beverley. Situated in Braintree, Essex, England, Andrewsfield Aerodrome is located 5 miles west of here. Formerly RAF Andrews. The runway has one orange sock and both runways are 18 metres wide but serve as a single 36 metre runway. Located 3.5 miles east of Watford, Hertfordshire, England, Elstree Aerodrome is an operational general aviation aerodrome located in Elstree around 14 miles from Central London. Biggin Hill Airport is located in the London Borough of Bromley which is located 13 miles southeast of Central London and is an operational general aviation airport. Rochester Airport is 2 miles south of Rochester, Medway, South East England with the river Medway 2 miles from th end of the Runway. IT is an operational general aviation aerodrome. Situated 2 miles northeast of Lydd and 13 miles south of Ashford. Lydd Airport is in the District of Shepway within Kent, England. We offer a number of flying lessons from different airfields on the outskirts of London. We offer a number of flying lessons in the Scotland area. Situated in North Lanarkshire, Scotland, Cumbernauld Airport is located 17 miles northeast of Glasgow at Cumbernauld. Leicester Airport was constructed in 1942 and was formerley known as RAF Leicester East and also as Stoughton Aerodrome. It is a small aerodrome 5 miles southeast of Leicester, England in Stoughton Leicestershire. Located in Kirmington in the Borough of North Lincolnshire, England, Humberside Airport is about 11 miles west of Grimsby and around 15 minutes from Scunthorpe and Kingston upon Hull. It is an International Airport. Wickenby Aerodrome is situated 9 miles North East of Lincoln, Lincolnshire, England. Liverpool Airport was operated by the RAF during the outbreak of World War II. Serving the North West of England, Liverpool John Lennon Airport is an international airport. Hinton-in-the-Hedges Airfield is made up of multiple grass runways and one tarmac. It is situated on the west side of Hinton-in-the-Hedges near Brackley, Northamptonshire, England. Eshott Airfield also known as Bockenfield Aerodrome is locationed 20 miles North of Newcastle, midway between Morpeth and Alnwick. It is a former British Royal Air Force World War II airfield in Northumberland, England. Enstone Airfield is used for microlights, light aircraft and motor gliders. It is a small civilian airfield located near Enstone in Oxfordshire. Haverfordwest Airport is situated in the middle of Pembrokeshire, from here you can fly over the magnificent rolling countryside and around the spectacular of the UK's only Coastal National Park. It is located adjacent to the A40 trunk road just 2 miles north of Haverfordwest. Located in New Scone Perth Airport is a general aviation airport, it is 4 miles northeast of Perth, Scotland. There are no commerical flights scheduled from Perth Airport, it is used by private and business aircraft. It is also used for pilot training. Situated in the Metropolitan Borough of Doncaster within South Yorkshire, England, Robin Hood Airport Doncaster Sheffield is an international airport located at the former RAF Finningley station at Finningley. Tatenhill Airfield is about 6 miles west of Burton on Trent, Staffordshire. It was fomerly RAF Tatenhill and is a licensed airfield operated by Tatenhill Aviation Ltd. It is also part of an estate held by the Duchy of Lancaster. Situated at Fairwood Common on teh Gower Peninsula, Swansea airport is around 6 miles south-west of Swansea, Wales. We have multiple airfields that we offer flying lessons from in Wales. Located 4 miles south southwest of Coventry city centre in the village of Baginton, Coventry Airport is situated about half a mile outside Coventry boundaries. Wolverhampton Airport is situated 8 miles south-west of Wolverhampton, it was formerly know as Halfpenny Green Airport and know locally as Bobbington Airport. It is a small airport near Bobbington village, South Staffordshire.